Like athenahealth said in the #LetDoctorsBeDoctors video, “tech should bind us, not blind us.” The EHR is the IT hub of just about any physician practice today. From scheduling to clinical documentation, to payment processing, the EHR is central to every practice workflow. With so many technology vendors in healthcare, some of the more progressive EHR companies have moved towards an ‘app-store-like’ model, wherein the EHR secures partnerships with vendors that provide services to add value to their clients’ practices. Athenahealth is a pioneer of this shift, as exemplified by their More Disruption Please marketplace – giving their clients access to a wide variety of technology solutions to help practices work more efficiently. Atheanhealth clients can schedule Chiron Health telemedicine appointments exactly as they would a normal in-person visit in athenaNet. When your staff schedules an appointment, they simply select “Chiron Telemedicine” from the appointment type dropdown, which triggers an automatic sync with the Chiron Health platform. Therefore no duplicate scheduling is ever required and no appointment will slip through the cracks. Both systems are cloud based, so appointments can be scheduled from just about anywhere! An important part of Chiron Health’s service is an automated insurance eligibility check specifically for telemedicine. Through a direct integration with atheanNet, Chiron pulls the patient’s insurance information right when the appointment is scheduled. This means no duplicate work for your patients either – all patient insurance information is collected and synced from athenaNet. Once this transaction is complete, the practice will be notified of any plan exceptions, so they can submit claims with confidence that they will be reimbursed. You might ask: But where do you document the visit, or reference the patient’s medical record? Exactly as you would for an in-person visit! That all happens in athenaNet exactly as it normally would. If the provider prefers to document during the visit, Chiron provides a lightweight Google Chromebook to sit side by side with the regular laptop or desktop where the charting is done. If documentation during the visit is not as important, the provider can use their normal device during the video appointment, and document afterwards in athenaNet – just like they would for an in-person. The workflow barely changes, if at all. The upside to all this? 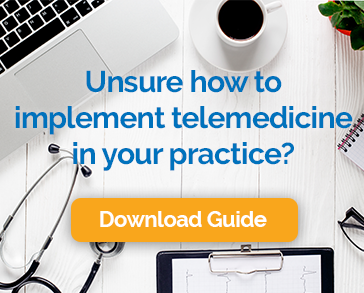 Providers that were previously calling out to patients over the phone for things like reviewing lab results or adjusting medications can replace those unpaid calls with billable telemedicine encounters. Those who make patients come back into the office for those types of appointments can now offer the convenience of a phone call without sacrificing reimbursement. Athenahealth practices can now offer telemedicine without the workflow disruption, all backed by Chiron Health’s Reimbursement Guarantee. Request a demo today to learn more.